Saint-Malo is usually thought of as a summer destination, since its long sandy beaches offer a pleasant holiday, but I believe any time of the year is good. While in summer the beaches are a big draw, off season it is much quieter and less touristy. In winter there are only few locals on the beaches and the restaurants and cafes in the old town are also more relaxed. Even if it rains the sun often appears and the dipped angle of the sun and the clouds paint a dramatic background. An awesome sight is when the high tide rolls in hitting the city’s wall hard and sprinkling the streets. In summer, be prepared for crowds – in winter, be prepared for rain. Louis de Funès is one of the greatest French comedians, along with actors such as Bourvil and Fernandel. Although he only became known in the USA with the 1974 international hit ‘The Mad Adventures of Rabbi Jacob’, he has performed in several other films, including the hilarious ‘Gendarme‘ series, where he plays Chief Marshal Cruchot of Saint-Tropez. Although wearing Police and not Gendarme uniforms, when I was boarding my ferry in Saint-Malo, the port authorities reminded me of the characters played by Funès and Michel Galabru. I am sure you can find the same comic couple everywhere in the world. Anyway, I’ve learned an important lesson from it; if you are a dual citizen, keep your two passports separately. Mont Saint-Michel is the highlight of the region, but there is much more to see. The best way to visit the sights is definitely by car – this gives the flexibility and freedom to explore the area and stay wherever one decides to stay. Organized tours are also a convenient way for getting to the main sights as you don’t have to worry about logistics in advance and worry if the trip will work out well. You can rent a car and there are many tour operators in the regional cities, such as Cherbourg, Caen, Roscoff, St Malo, Bayeux or Rennes. You can get to these places by train within France and/or by ferry from the UK. Although very infrequent, public transport is also an option, at least to some of the main sights such as Mont-Saint-Michel (MSM). You can arrange the tickets in advance for longer trips and you can take local services without advance booking. MSM can be connected to Paris using the combination of the TGV fast train and local buses. The whole trip can be booked online in advance on the http://www.tgv-europe.com/en/ or http://www.voyages-sncf.com websites. For further info see blog post: SNCF – booking trains in France . Visiting MSM from the coastal town of Saint-Malo, itself a worthy destination, is even simpler. Saint-Malo can be reached by TGV directly (SNCF – booking trains in France) or by ferry from the UK on the http://www.brittany-ferries.co.uk website. For further info see blog post: Brittany Ferries – crossing the Channel . From Saint-Malo there are two buses a day to MSM, departing from the railway station (Gare TGV) at 9:40 and 16:30 – the bus also stops a few minutes later at the tourist information office (Saint-Vincent), which is 5 minutes walk from the ferry terminal. You have to change bus at Pontorson railway station but there are connecting buses. If you take the morning bus from Saint-Malo, you can get back the same day at 15:45 from MSM or 16:25 from Pontorson. If you take the afternoon bus, you can get back the following day at 9:20 from MSM or 9:55 from Pontorson. If time permitting, the overnight visit is better – you can see the mont at sunset, illuminated at night and early morning – the best colours and least crowds – and at different tides. There is a wide selection of accommodation in the area including MSM itself. The fare for the whole bus trip from/to Saint-Malo is 5.50 euro one way. Mont Saint-Michel, the “Merveille de l’Occident” (Wonder of the West) owes to its original setting and its fine architecture its ranking as one of the major monuments for visitors to France. Around a kilometre in circumference, this rocky islet rises to a height of 80 metres and is linked to the Bay by unfloodable causway built in 1879. It is a UNESCO World Heritage Site. Although my great grand father died on the wrong side in World War I, being sent as a K und K soldier to the Russian front to fight for the Austrian empire, he was just as a victim as soldiers on the other side or any other innocent people who died, and continue dying, in wars. And although no poppy flowers grow on the streets of cities and the victims of wars are not always uniformed, as far as I am concerned, they all are remembered. In the UK you could see people wearing the poppy flowers weeks before and weeks after the 11th of November. Chinese officials complained about the use of poppy as it reminded them the Opium wars, but I can assure them this is not the same poppy. A handful of Muslim extremist made a bit of noise, but the Muslim community in general understands that most British people think about this event and the victims of wars the same as I or most of us do. Even we, thousands of miles away from conflict zones, are victims of these same wars, even if in much less drastic ways. “Armistice Day (also known as Remembrance Day) is on 11 November and commemorates the armistice signed between the Allies of World War I and Germany at Compiègne, France, for the cessation of hostilities on the Western Front, which took effect at eleven o’clock in the morning—the “eleventh hour of the eleventh day of the eleventh month” of 1918. Paris and London are some of the highlights for many visitors to Europe, along with other popular destinations such as Rome, Barcelona, Edinburgh, Brussels, Amsterdam, Munich and Vienna. While most of these cities are some distance apart and it is more convenient to fly between them if someone is constrained by time, London and Paris can be easily connected by different means. Budget flights: There is a number of budget airlines which offer very cheap rates, but considering the time and costs of transfers, probably the best way to connect Paris and London is by the Eurostar train service. Eurostar train: One of the easiest and fastest way to connect the two capitals is by the Eurostar train, which takes a little less than 2.5 hrs. The biggest advantage is that you can start in the center of one city, and arrive in the center in the other one (St. Pancrass station and Gare du Nord), saving you time and money. Considering transfer times and costs, it is very competitive – and probably better – than the budget flights. You have to book as early as you can to get the best rates, but making a test booking today for only one week ahead (November 25) I found the cheapest rate, for the early morning service, was £39.00 – not bad at all. Euroline coach: Coach journeys tend to be more tiring than traveling by train, but this is not necessarily true for the Euroline coach. Although their buses are slower than the Eurostar train, you have the chance to get out on the ferry and breath some fresh air or have a drink in the bar. You will pass the White Cliffs of Dover, an impressive sight. Coach-ferry-train combo: This is the slowest and probably the most expensive of the options – but this is the most interesting and it can still be done fairly cheaply. From London you can take a coach or train to one of the port cities in the south – Portsmouth, Poole or Plymouth – and take the ferry from there to either Caen, Cherbourg, St Malo or Roscoff. 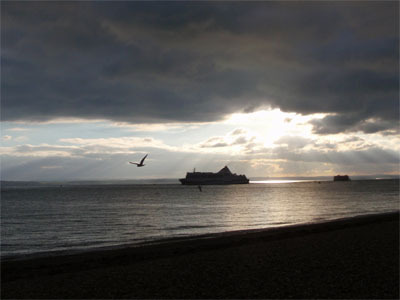 An interesting route would be London to Portsmouth by train or coach – the closest destination to London – then a ferry to St. Malo, with a side trip by bus to Mont Saint-Michel, and then onto Paris by train.